Updated Sunday April 14, 2019 by Kelley Holloway. ROSL/Jaycees are proud to host the local Pitch Hit & Run competition. 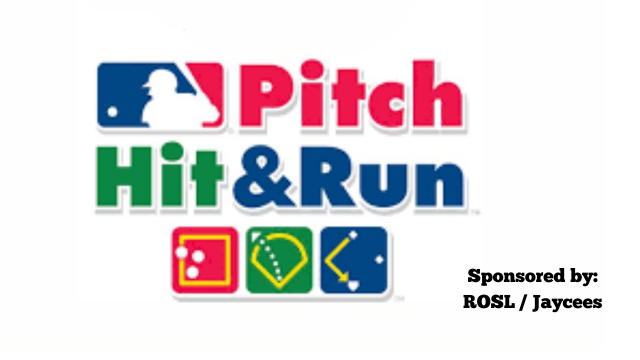 Pitch Hit & Run provides youngsters (age 7-14) across the country an opportunity to participate in an exciting baseball/softball skills competition. This national initiative gives boys and girls, the chance to showcase their pitching, hitting and running abilities. There are two separate divisions of Pitch Hit & Run; baseball and softball. Participants may compete in either division. Participants will compete in each of the three components of Major League Baseball Pitch Hit & Run and accumulate a total score based on his/her performance. This event is the first of four levels of competition -- Local, Sectional, Team Championship and National Finals.